If you're not able to post anonymously in this forum posting.php?mode=post&f=62 or anywhere on this site that allows anonymous posting. Please chime in https://github.com/gothick/phpbb-ext-re ... /issues/18 so we can get the developer to fix the problem if there is one. I experienced it numerous times when I used to post anonymously when clicking "Post Reply" button on any thread. The capcha simply never loads for me. ^^^ That's what happens every time I click "Post Reply" since the past few months. I disabled Quick Login extension. Let me know if things change for you. Ah yes that's right existing thread only. Lanik wrote: I disabled Quick Login extension. Let me know if things change for you. Still the same, no change. I've updated the plugin as of this morning. @Mark and @smed79 can you guys try again please. Yes looks that way. If anyone else is having issues please speak up while we have the developer available to help. Works fine now. I will check and see if there are any other underlying issues to report. Seeing as this is no longer a problem (judging by lack of reports) I'm going to unsticky this. If you still can't post/reply anon speak now or forever hold your peace. Click on "Mark All" - nothing happens, the keys don't get selected. Same thing happens with "Unmark all", select all manually one by one and then click "Unmark all", nothing happens. Looks like the code is broken/missing. Requires investigation. -Mark- wrote: I had a static filter named "/cloudflare/rocket.js"
I came across a site a long time ago where rocket.js was pulling an ad banner after being loaded, so I blocked it based on mistrust, good find smed. Nothing on fire yet. I do suggest you don't block cloudflare or I can't guarantee what you're going to see on this site since I am using it CloudFlare for SSL etc. Killing third party resources does help me gain faster loading time with uBO/uMX and puts a stop to any potential ad from appearing, for this forum it breaks functionality, that's why I unblocked "rocket.js", otherwise the more you block unwarranted and unnecessary resources, the faster the website loads AKA Block ALL/Allow EXCEPTIONS mode.You should try that with uBO and see for yourself. 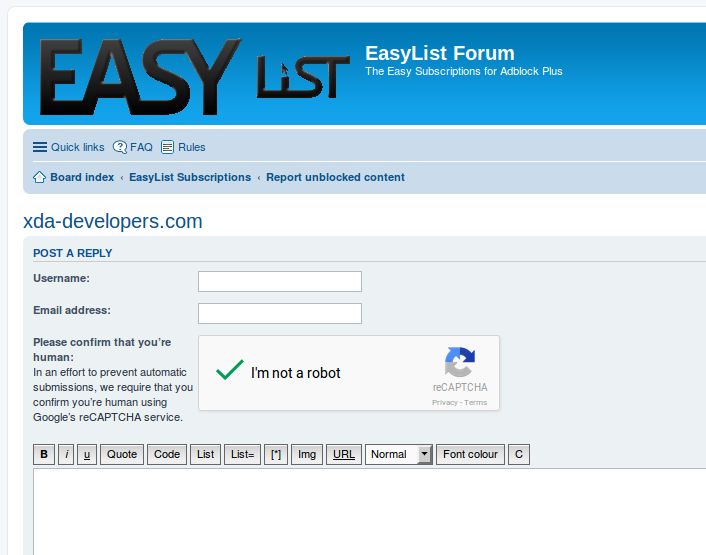 Updated the ReCaptcha 2.0 extension to the latest release again. Let me know if you see any issues or forever hold your piece. Thanks I purged all the forum cache. I'm not seeing any errors right now. I just logged out and tried to post anon, saw another reCaptcha, no problem. Logged back in another reCaptcha again no problem or errors. Post or reply to an existing thread ? I tried to do a post not a reply. Okay I put the older version that was working back. So now you shouldn't get any more errors until the developer has a chance to take a look at it. Lanik wrote: I put the older version that was working back. Ha, oops. Try that again.